The boxes were FULL of treasures, but this one in particular caught my eye, even though I'm not a huge devotee of this era. But look at those gathers, and the sweet curve of the neckline! The only thing I can't decide is what fabric to use. I was thinking "huge floral!" (because I always think "huge floral!") but this might also be adorable in, say, gingham. Or seersucker. Or even eyelet. Ideas? Oh, if you want to see the back of the pattern, it's here. Being that you are the best expert I know on vintage patterns, I have a question for you. 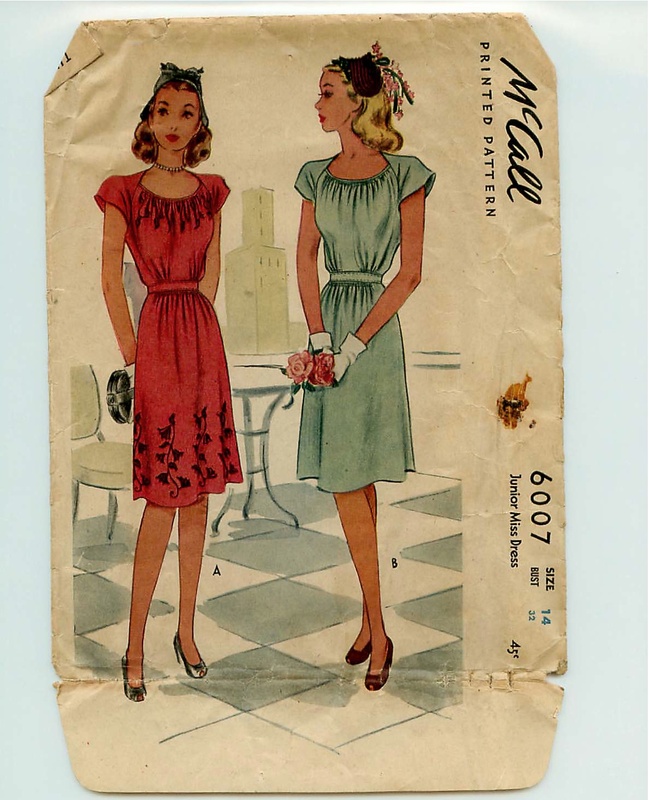 I’d like to make up some garments from vintage patterns but I am worried about the sizing. With modern patterns, particularly Butterick, if I go by their measurement scale provided it tells me to make the dress 3 sizes bigger than I actually need! Is this a common problem when sizing for vintage patterns or are they pretty true? Thanks Carol. Actually I was referring to my body measurements. I take them all down accurately and the size the pattern then give me is always 3 sizes too big? how does this happen? Is it something to do with averaging body sizes to measurements? For example – do they think that if your hip measurement is X then you shoulder will therefore be Y.
Super Kawaii Mama, YES. This DOES mean they think if your hip measurement is X then your shoulder will therefore be Y. In this case, all the scaling up and down is based on your BUST measurement.Are you buying your patterns by your bust measurement, as the pattern companies tell you to?Ladies, sing it with me if you know the words:Unless you wear a B-Cup Bra, and you know you are wearing the right SIZE bra, DO NOT BUY PATTERNS BY YOUR BUST MEASUREMENT!ALL patterns are sized AND SCALED for B-cup bras. That 40″ bust-size pattern? That’s sized for a 38B bra. That 38″ bust-size pattern? That’s sized for a 36B bra. That 34″ bust size pattern? That’s sized for a 32B bra.If you are a rather small-boned person who wears, say, a 32D bra (which means your bust measurement is 36″), and you buy a pattern with a bust measurement of 36″, tra la tra la, thinking it’s the right size, IT WILL BE TOO BIG. It will be GINORMOUS in the shoulders, in the neck in the back. You will be wearing Bag City, and you will wonder why, because you bought the right size pattern, didn’t you?No. You did not. You needed to buy a size 32 pattern, and enlarge the bust area only on the pattern. Normally, a good patterns alterations book will explain that if you’re over that B cup, measure your chest – under the arms, but ABOVE the bust – and use that number as if it was your bust size, to buy the pattern.I’ll give you a faster code: Since we all KNOW (now) that the patterns are sized for a B-cup, first: make sure you are buying the right size bra. THEN: USE THE NUMBER OF THE BAND SIZE TO BUY YOUR PATTERN. You wear a 40C bra? Buy a size 40 pattern, and enlarge the bust 1″. You wear a 36D bra? Buy the size 36 pattern, enlarge the bust 2″. You wear a 32H bra? Oy. Buy the size 32 pattern, enlarge the bust 6″, and be prepared to wear a lot of princess-seamed bodices. For every size up over a B cup that you wear, prepare to enlarge the pattern front ONLY, an inch per cup size (that’s a HALF-INCH per HALF-PATTERN piece, one inch total for both pattern fronts, per cup). You may need other alterations as well, but this is about sizing based on the bust. This way, you are getting a pattern that is scaled to the bone structure, and adjusting it for your individual padding.NOTE: Some pattern styles, and some pattern companies, do allow for a great deal of “ease” – wearing ease, which is room to breathe in the garment, and style ease, which is determined by how loose or narrow the shape of the garment is. (Plus, there’s the “room for error ease.”) I suspect you may need a smaller pattern, if you are consistently finding the ones you get are too big. If you ARE a B cup, and your bra is the right size (that is, you’re wearing a B cup, and you actually are a B), then the patterns have more ease than you want. If you’re buying a multi-size pattern, make sure you’re cutting out the right size out of the group for you. If you HAVEN’T been using a multi-sized pattern, see if you can find a pattern you like that comes in a multi-size which includes your current (too big) size and a couple of smaller sizes, and be prepared to make it in each size until you find the right one. You may also find the occasional pattern, God bless them, that includes MULTIPLE BODICES – sized for an A cup, a B cup, a C cup, a D cup, and sometimes a DD cup. They are rare creatures, though, and worth buying when you see them just to have them to work with. They’re very useful for altering those patterns which do NOT have multiple bust sizes offered. Belladonna, thank you for that. I’ve been sewing for years and I didn’t realize.Then again, I’ve got broad shoulders, which allowed me to get away with the larger bodice and not notice. Ugh, my apologies, I had a Bad Math Moment. My first Shortcut had Wrong Math. Instead:ALL patterns are sized AND SCALED for B-cup bras. That 40″ bust-size pattern? That’s sized for a 38B bra. That 38″ bust-size pattern? That’s sized for a 36B bra. That 34″ bust size pattern? That’s sized for a 32B bra. (That part is CORRECT. Below is some more CORRECT STUFF. )You can see by this that you buy a pattern that is two inches bigger than your band. So, the 38-whatever cup buys a 40 pattern (because its sized for a 38 band, B cup), and if her cup size is bigger, she makes the adjustment. A fast size list: size 30 bra band looks for a pattern with a 32 bust; size 32 bra band buys the pattern with a 34 bust; size 34 bra band buys the pattern for a 36 bust; size 36 bra band buys the pattern for a 38 bust; size 38 bra band buys for a 40 bust; size 40 bra band buys for a 42 bust; and I dont have the other size conversions, which dont stay as tidy and symmetrical.It works the same way for A and AA cups too, except that they make the front bodice pattern SMALLER, after buying the regular pattern which is two inches bigger than their band sizes. The pattern gets made smaller in the front, where they are smaller; but all the rest of the proportions will be right for them. That is the theory, at least; so the 34AA bra wearer would buy a 36″ pattern and flatten out the darts. Muslins are HIGHLY RECOMMENDED – as always! La Bella Donna: Thank You! That certainly sheds some light on the issue. I’ll have a crack at some today and see what miracles happen.